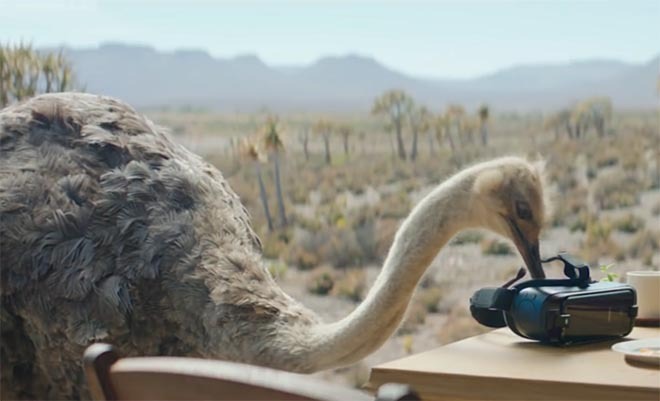 Samsung is promoting the release of the new Samsung Galaxy S8 Gear VR headset with a commercial featuring an ambitious ostrich with a hankering for flight. The ostrich steps into a front porch to check out breakfast leftovers and accidentally pokes its head into the headset. The African plains are replaced with the clouds of a flight simulator. To the sounds of Elton John’s track, “Rocket Man”, the ostrich trains for what is impossible, lift off, much to the bemusement of the rest of the flock. However all comes together, with the super, “We make what can’t be made so you can do what can’t be done” and the tagline, “#Dowhatyoucant”. The Samsung Ostrich campaign was developed at Leo Burnett Chicago by global chief creative officer Mark Tutssel, US chief creative officer Britt Nolan, creative directors Colin Selikow and Vince Cook, associate creative directors Chris Walker and Alan Shen, director of music Chris Clark, assistant music producer Alec Stern, executive producer Matt Blitz, global business lead Radim Svoboda, global account director Ashley Beam, global account supervisor Huy Ngo, global account executive Emily Smith, global strategy director Kara Yang, global strategy director Chris Bridgland, talent manager Mike Hurley, senior business manager Rhonda Senase-Thome, working with Samsung global marketing for IT and Mobile Division Younghee Lee, Global Head of Integrated Marketing Pio Schunker, Global Partnership Manager Daniel Taehyun Kim Global Partnership Assistant Manager Alison Daeun Han. Filming was shot by director Matthijs Van Heijningen via MJZ. Editor was Jono Griffith at Work Editorial. Visual effects were produced at MPC by VFX executive producer Karen Anderson, producers Nicole Saccardi, Tomek Zietkiewicz, Sophie Lebreton, and Neela Kumuda Parankusham, previs team Jeremie Abrial and Xavier Zahrra, coordinator Dori Sharvit, creative directors Michael Gregory and Diarmid Harrison Murray, colorist Mark Gethin, color executive producer Meghan Lang, color producer Rebecca Boorsma, associate color producer Elyse Robinson.